Walmart (WMT - Get Report) defied investor and analyst expectations, posting strongest sales growth in more than 10 years. The shares jumped 9.7% as of 11:33 a.m., after the company reported its net sales increasing 4% in the fourth quarter. "This is one of those quarters where the world sits around and says: 'We misjudged Walmart: it's back'," said Jan Rogers Kniffen, a consultant to retail investors at Kniffen WorldWide Enterprises, noting that Walmart's growth statistics were "most extraordinary." 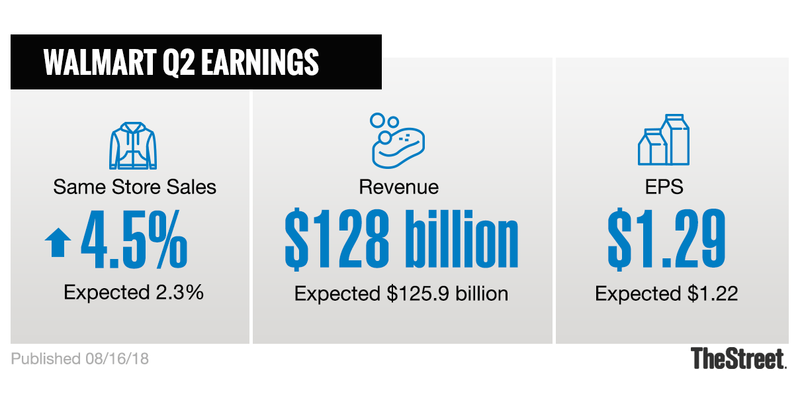 CFO Brett Biggs noted the company's historically strong quarter in the earnings presentation early this morning. The growth in sales for the US segment nearly doubled analyst consensus, which was set at 2.4% according to a Credit Suisse analyst note. Credit Suisse research analyst Seth Sigman noted the figures as his main focus and the driver of the stock move today in a note published this morning. "Results include the strongest comps in years, a reflection of WMT's various in-store and online initiatives and likely an indication of solid market share gains, and an overall healthy consumer backdrop," he wrote. "That should be the focus today." Despite his positive focus, Sigman slated a price target of $85, maintaining a neutral rating on the stock. As Walmart is raising its guidance figures moving forward and revenue tops $128 billion quarter over quarter, analysts are drawing a more focused lens on the company so as not to be so surprised by the strength of its numbers. The growth helped the country post annual sales figures exceeding half of a trillion dollars across all business lines. International sales growth aided in the increase as net sales increased across the business segments abroad. The increases of 4.3%, 7.3%, and 2.8% in China, Mexico, and Canada respectively helped the international segment achieve a $29.5 billion in net sales in the second quarter. This does mark a slight decrease from the previous quarter when the company reported $30.3 billion in international sales. Still, the spike in the shares on the back of the overall revenue growth stems the tide of a tough 2018 for the retail giant, which has seen its stock drop from a high of $109.98 in January to mid-80s for the bulk of the year.